Home → Resources → Living in the CSPA → What is a Wellhead Protection Area? A wellhead is the physical part of the well that sits above the ground. It’s the exposed well casing and is commonly referred to as the “stick‐up”. A wellhead protection area (WHPA) is the area around the wellhead that contributes source water to a drinking water system (i.e. a municipal well). A WHPA shows where groundwater is coming from to supply a municipal well, and how fast it is travelling through the ground toward the well. WHPA‐E is an area where the groundwater is under the direct influence of surface water. This means that there may be direct pathways from the ground surface to the well, making the drinking water source vulnerable to contamination from the ground surface. In the CSPA, there is only a WHPA‐E for the Cana WHPA, and the Lansdowne WHPA. The vulnerability of each zone for every wellhead protection area in the CSPA was determined based on a number of factors that account for how easily the groundwater could become contaminated from activities on the ground surface. The wellhead protection areas in the CSPA are generally vulnerable, since soils are relatively thin and permeable, and the underlying bedrock has many gaps (called fractures). 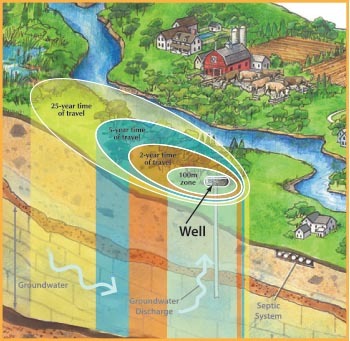 The zones closest to the well in a WHPA have the highest vulnerability, since there is less time for pollutants to break down and for clean up to happen, before the water reaches the well.